Many sophisticated consumers or professionals who purchased a condo in St Petersburg and along our beaches in the area have two complaints; the kitchens are dated and they are small. Kitchen remodeling is possible in your condominium; it just takes a company who has experience like Silver Palm Custom Homes & Remodeling. Our condominium kitchen remodeling services have helped many owners turn their dated and cramped space into a kitchen that really works for their lifestyle. We offer a full line of custom cabinetry that can have under cabinet lighting, granite or quartz countertops, and can recommend the best appliances to meet your needs and available space.. If your kitchen’s layout works for you but you’re interested in remodeling your kitchen to add granite countertops, new appliances, and modern cabinetry, we can help. We’ve transformed many kitchens in condos that were dull and dated into modern centerpieces of the home. Our process includes meeting with you in your home to discuss what changes you’d like to have in your kitchen, measuring your space, and then recommending products that work for your home and budget. Sometimes small changes like removing a soffit wall above the cabinets and using 42” cabinets with crown molding add significantly to your storage and creates a stylish and finished look. Sometimes condominium kitchens are galley style with limited counter and storage space and in many cases the cabinets used by the builder have shelving that is virtually useless. Other times its dark and cramped because there is a wall or pass through and ineffective florescent lighting on the ceiling. We’d love to look at your current kitchen layout and work with you to redesign it for better flow in the home. By working with you in your home, we can help you visualize the space and share with you design opportunities that we may see while there. We will request floor plans to help ensure we aren’t met with any surprises during the kitchen renovation. No matter what your desires for your kitchen renovation in your condominium are, we will provide you with an honest assessment of what can be done and work with your condominium association to get our plans approved. 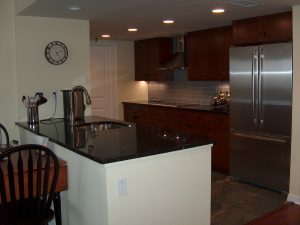 Contact Silver Palm Custom Homes & Remodeling, St. Petersburg’s experienced condo kitchen remodeling company. Call us today at (727) 420-6693.